The team at White Bay 6 Marine Park undergo training both as individuals and as a team in order to ensure their workplace is a safe one. Utilising on the job training from staff members and structured courses from outside professionals, the WB6 work environment is a run to the highest standards for not only safety but also so your boat is taken care of by skilled team members. 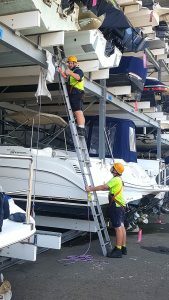 Last week the appropriate yard staff completed the National unit of competency RIIWHS204D – Work safely at heights. 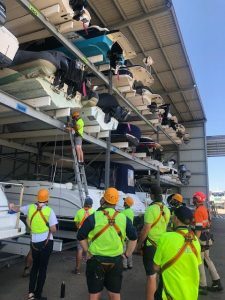 The training was conducted onsite by an experienced Height Safety Specialist and included both practical and classroom training over a ten hour day.